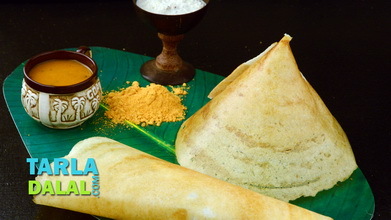 Nothing like this Neer Dosa to soothe your palate! Made with a simple batter of raw rice, this dosa has a soothing flavour and a mildly chewy texture that is very appealing. The batter for this dosa does not require any fermentation. Although simplicity is the highlight of the Neer Dosa, it requires a bit of expertise to prepare it perfectly. Put the jaggery in a broad non-stick pan, mix well and cook on a medium flame for 2 minutes, while stirring continuously. Switch off the flame, add the coconut and cardamom powder and mix well. Cool, store refrigerated and use within 1 day. Combine the drained raw rice and ½ cup of water in a mixer and blend till smooth. Transfer the mixture into a deep bowl, add 1 cup of water and salt and mix well. Heat a non-stick tava (griddle) till red hot, sprinkle a little water on the tava (griddle) and wipe it off gently using a muslin cloth. Grease the tava (griddle), with a little oil and pour approx. ? cup (approx. 5 tbsp) of the batter on it and tilt tht tava (griddle), in a circular motion to make a round dosa. Cover with a lid and cook on a medium flame for 1 minute. Fold the dosa into a triangle.